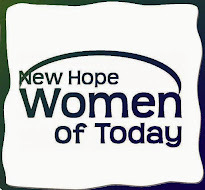 New Hope Women of Today: The New Hope Women of Today serve the community in a number of ways. The New Hope Women of Today serve the community in a number of ways. Thank you Shannon for the great PR.